Casey O'Brien Blondes – Soulac-sur-Mer: triple threat Médoc resort. Soulac-sur-Mer: triple threat Médoc resort. 500 quaint to quirky mid 19th and early 20th century villas ‘Soulacaises’. 12th century Basilica of Notre Dame-de-la-Fin-des-Terres, excavated from a sand dune in 1860 and now a Unesco World Heritage site. Small-scale reproduction of the Statue of Liberty cast by Bartholdi in 1888 facing her American sister across the Atlantic. Just when you’re convinced there can’t be more hidden treasure along the Atlantic coast – you hit on a sleeper like Soulac. Why didn’t I know about this place? 100 kms north of Bordeaux and a hop across the Gironde estuary from Royan – it merits better name recognition. Soulac has the architectural potential to be a mini Savannah or South Beach of the French Atlantic coast, yet remains a little known family resort. Arriving from the north or east, the easiest way to get there is a 30-minute car ferry from Royan. Leave time for a quick tour of the city. 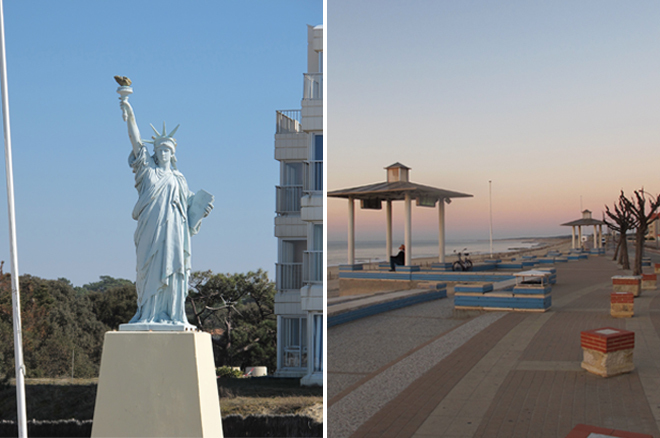 Royan is a brilliant white-painted concrete 1950’s time capsule. The old city was obliterated on January 5, 1945 by Allied carpet-bombing intended to annihilate intransigent Nazis. A massive urban renewal project attempted to compensate for thousands of citizens killed due to tragic miscommunication between an American general and the French military concerning evacuation. A scenic alternate route is up the peninsula via Bordeaux. The winding road along the Gironde Estuary traverses fabled Chateaux vignobles – Margeaux, Latour, Mouton-Rothschild and Lafite – ending in Saint Estèphe, before leaving the undulating Haut Médoc terroir to enter the marshy flatlands of Médoc. The landscape is a mixture of sand dunes and scrub pines on the ocean side, and marshland along the estuary. The eastern shore is scissor cut with minute tidal ports, where modest pleasure and fishing boats keep company with cabanes de pêcheurs cantilevered over the water on stilts. The most picturesque to my taste is Port de la Maréchale next to St-Seurin-de-Cadourne. In mid March, Soulac was emerging from winter hibernation. Its population of 3,000 expands July through August to 55,000, but tourist season builds up slowly. My first hotel choice – Hôtels des Pins in Amelie Beach at the southern edge of town – opens in April, so we settled for Hotel Michelet, a small 2 star a block off the oceanfront. The establishment is impeccably clean and professionally run, but shrill décor, circa 1995, is hard on the eyes. Imagine the decorating section of a DIY homestore like Leroy Merlin. The Michelet’s central location, plus sea views and a balcony in chambre 10, compensated for clashing color schemes. Philippe the proprietor couldn’t be nicer or better intentioned – even going so far as to deliver a breakfast tray at seven am. Our Lady of the Ends of the Earth is an apt name for the Romanesque Basilica nestled at the heart of town. Back when Saint Veronica (buried in the church) was proselytizing the Gironde peninsula, the former Benedictine abbey at its tip was indeed remote. Were it not for occasional passage of St. Jean de Compostel pilgrims crossing the Gironde estuary, it would have been completely ignored. Over the centuries, Soulac fell into obscurity as the dunes encroached on the Basilica to the point of swallowing it up. By the 18th century, farmers drove metal rings into the barely protruding stone towers to attach livestock. Today, pines teetering over the edge of the sandy cliff above Amelie Dune testify to ongoing errosion, and make it possible to imagine how a monastery could be engulfed over the centuries. In the mid 1800’s, the fashion for bathing cures accelerated development of ‘Soulac-les-Bains’, and construction began of its charming Côte d’Argent style villas. Escavation and restoration of the Basilica in 1860 brought more visitors. A second wave of villa construction followed in the early decades of the 20th century with a more idiosyncratic ‘post colonial’ vernacular featuring turrets, pavilions, jutting wings, balustrades and porches. Lacey punched wood fretwork and terracotta roof tiles were de rigor, along with brightly hued painted wood trim. Colonnaded first floor balconies evoke the architecture of French Caribbean and African island colonies. Each villa has a romantic or sentimental name enshrined on painted tiles, carved stonework or cursive script under the peak of a central eave above the front door. Stop by the Tourism office (next door to the cinema) for times of guided tours offered in several languages. Ten to 15 years ago, a vintage gingerbread brick villa could be had for 40 thousand euros, but now a 75 m3 cottage & garden requiring work, sells for €350M (still a bargain by Cap Ferret standards, where a characterless shack goes for significantly more). Buyers are primarily French, while tourists are German and Dutch, with a smattering of British. On your tour of centre ville, don’t miss the handsome market building. Its cavernous hall is filled with rows of food, wine, florist and flea market stalls. A side wing is devoted to fish and seafood. Open daily year round from 8am to 1pm, and again during July & August between 5 and 8 pm. Restaurant choices in March were limited, especially midweek, but it’s evident that plenty of variety exists for summer vactioners. Tables on the glass veranda of Le Grill Océan on the Front de Mer enjoy an idyllic view of sunset over the beach – just the place to marvel at the conjunction of Venus and Jupiter in the velvet night sky on March 13. For seafood lovers, a €25 dinner menu includes large fresh oysters or a tureen of terra cotta hued fish soup as a starter, and grilled dorade or mussels in cream sauce for the main course. Desserts are homemade. Inexpensive white Bordeaux and Côte de Gasgones on offer. A 2009 Château de Teste provided a satisfying switch from Loire Valley white. La Villa Soulacaise, also recommended by our host, was closed for dinner. The surprise of the visit was coming upon a replica of the Statue of Liberty perched atop a pedestal at the north end of ocean drive. It arrived clandestinely in Soulac in 1941 when French rail workers intercepted a train shipping it from Bordeaux to Germany, where it was destined to be melted down for armaments. In Bordeaux the statue had been the centerpiece of a giant fountain in Place Picard, but after the war Soulac held on to her. Following Liberty’s gaze toward the horizon, you’ll spot the iconic silhouette of Phare Cordauan. Built in 1611, it is the oldest French lighthouse in service and the last to be inhabited full time. The lavish interior includes a chapel where weddings and baptisms take place. Nicknamed the Versailles of lighthouses, Cordauan is accessible at low tide on foot from neighboring Le Verdon-sur-Mer, if you are up for a 7-kilometer hike across the sand bar. It’s hard to project how Soulac’s genteel ambiance is affected by summer crowds. In the old town center, streets are narrow and can’t handle much car traffic. Locals I met claim it remains off the radar despite development of the huge Médoc marina complex nearby, capable of harboring large boats. The square and adjacent sidewalks in front of the Basilica were being renovated under supervision of historic preservation, so access roads were sealed off with metal grills. I managed to squeeze through a gap in the fencing and approached a group of stonemasons to inquire if the church was open. None of them spoke French, so I tried English and one happily spoke up. Not surprisingly they were Portuguese. Sadly the church was closed but they had no problem with me wandering around and I was able to admire exceptional carved stonework at the back. Another excuse to return in warmer weather to better sample Soulac’s ample charms.